Gas cylinder storage safety tips by US Chemical Storage. Compressed gases are used for many different industries and applications. Compressed gases are also used in many different educational programs such as research laboratories, medical laboratories, health sciences, fine arts, welding and diving. The hazards associated with improper gas cylinder storage can be fatal, so gas cylinder storage safety is necessary. Gas cylinder storage safety can eliminate potential hazards when handling or using gas cylinders. Take proper precautions to prevent injuries and other hazards including fires, explosions, chemical burns, cold burns, and poisoning. Check for leaks, dents, or damages on each gas cylinder before handling. Ensure the valve cover is on properly. Each gas cylinder must have a proper label that addresses potential hazards with the cylinder’s contents. Wear proper protective equipment before handling or moving each cylinder. Make sure a Material Safety Data Sheet (MSDS) is available with each type of compressed gas. Store corrosive cylinders away from flammables. Store full cylinders away from empty cylinders. Segregate oxiders away from other cylinders. Use proper racking and shelving inside your chemical storage building. Secure each gas cylinder properly. Mark each cylinder FULL or EMPTY. Keep cylinders away from heat sources, static, electrical wiring, and other ignitable sources. 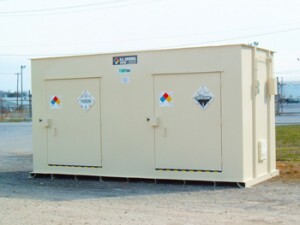 Store cylinders in an upright position in your chemical storage building. Cylinders should be marked with a DOT or an ICC marking that indicates regulations for the cylinder’s contents, the serial number, manufacturers symbol, and purchaser/user. Do not slide, roll, or drag gas cylinders. Do not attempt to catch a falling gas cylinder. Use a cylinder hand-truck for moving individual cylinders. Store only the required amount of cylinder storage. Get compliant and stay safe with US Chemical Storage.